We love these versatile, durable, handmade, petite "dipping" dishes. Great to add to each place at your table with a bottle of our organic olive oil, but they also work well for serving our Branches Preserves, or to keep your sea salt for quick dispensing. These were a find right here in the Napa Valley made by a local old-time ceramicist...each piece is hand glazed in creamy white and there is subtle variation from one to the other which gives them their charm. 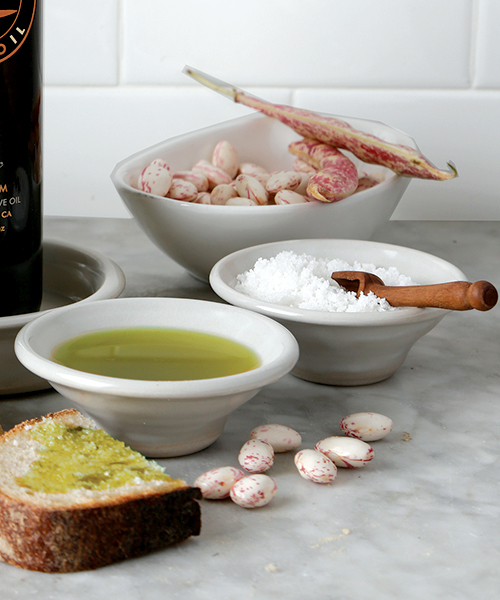 They make the perfect add on with a bottle of KATZ Organic EVOO; and you may want to include an olive wood scoop too!